Here we have the Daewoo KOR6N9RB - a cheap 800w microwave offering 20 litres capacity, and finished in a gloss black and chrome design. 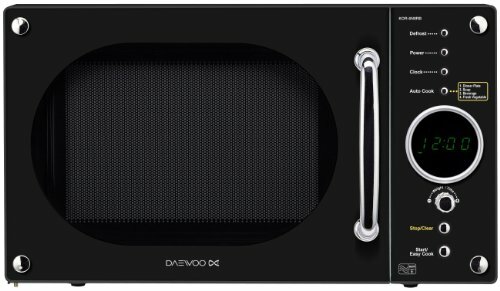 The Daewoo KOR6N9RB is a relatively small 20 litre capacity solo microwave, finished in a gloss black colour scheme, and providing 800w of power. Priced at around £60, it's aimed at the lower end of the microwave oven market - it's a pretty cheap microwave, and is easy to use. The overall styling is slightly retro - in particular the handle and circular timer features a slightly quirky design - modern yet with a retro twist. 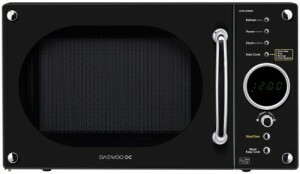 The black and chrome finish looks pretty smart - overall our testers were complimentary about the aesthetics of this cheap microwave from Daewoo. The KOR6N9RB's digital display is easy to read, and the controls are pretty simple to use - we were up and running in no time. The child lock feature works well, and overall we were quite impressed with this microwave. We have heard reports of some of this particular model not being reliable in long term use, but we did not experience any issues with the KOR6N9RB during our test period. 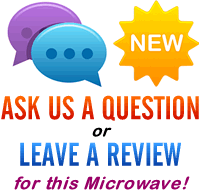 Overall a decent entry level microwave - unusual design, but was easy to use, and impressed our testers.